The Lions biggest need may well be a Safety, and there are many intriguing prospects. Will be interesting to see which ones rate 1st and 2nd round grades as the draft approaches. It might be more likely they go corner or DE in the 1st. Can't pass up the chance to get a topflight CB if it falls in your lap. That would be 1st priority on my list, then Safeties in the 2nd or 3rd. Don't see a lot of high round interior line prospects in this years draft, much to my dismay. Doesn't matter anyways, Lions will probably continue to ignore this major need. If they take a RB or receiver in the 1st 3 rounds I will be beside myself. Imperative Mayhew does a better job of identifying talent in the middle rounds. In 2010 he whiffed on Spievey and Fox is a question mark. In 11 he blew it on Young (headcase) in the 2nd when he could have taken Torrey Smith, and Hogue with the 5th still hasn't impressed. But in all fairness, felt last years draft was an improvement. Questioned the Broyles pick, but it may pan out, and the young LB's and secondary additions later could help if any develop. How in the hell was last years draft an improvement? We didn't get ANY starters. I fear you're weighing most of your analysis based on the front office and coaching staff championing Bentley and Lewis, who have both shown next to nothing. IMO last years draft was a complete disaster, and one of the worst of the last decade. it's way too early to say that the previous draft was a disaster. The general consensus is it takes 3 years to properly grade a draft. If we end up with a starting LT, a starting WR, and at LEAST 1 starting db ( more than likley you can add a nickle CB to that list as well) I'd say that is was a damn fine draft. BUT...the guys have to perform first. 8 games is simply not a big enough sample to say if they will or not. And I simply can not understand how you can say any draft now could be as bad as the Millen era....you're letting bitterness get the better of you man. You cant tell him nothin' regularjoe. Lets see, Broyles is starting now and is doing pretty darn good. Reiff has been getting a lot of playing time and STATISTICALLY they have better offensive efficiency with him in than the other way around. Bentley started until he got hurt. Jonte Green has been starting and has looked better than your average rookie IMO. Also think that T. Lewis and/or Whitehead are our LBs of the future. We do not want Rookies starting if we can help it. What rookies would we have taken that would have made a difference in this season. Blind Hate. Talent is talent, rookie or not. Plenty of better teams than the Lions have rookies as starters, and continue to be better than the Lions. Typically in the NFL, first round selections (other than QBs) will start for their team. I certainly didn't hate the Riley Reiff selection, but I felt that David DeCastro was the wiser pick. Impossible to know just how good who would have been this year, since he got hurt in Pittsburgh. Our second round pick could have been Peter Konz, who is now a STARTER for the Atlanta Falcons. That's a SECOND ROUND pick that's starting on their offensive line for a team bound for the playoffs. He would have represented an improvement over Stephen Peterman, as would have DeCastro, in my opinion. And not to mention what Konz is doing in Atlanta he could be doing the same thing here in Detroit. Starting at RG and being the future at Center. 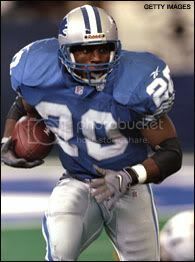 Agree, when the Lions took Broyles in the 2nd round I'm sure I wasn't the only one thinking WTF. I was right there with ya! Over the past few seasons, the average NFL team has found LESS THAN ONE first-year starter in each draft (defined as a week 1 first-team offensive of defensive player). Yes, there are examples of teams with rookie starters and some teams that have found two or even three rookie starters. However, teams that are average or better-than-average don't expect to find multiple rookie starters every year. If a good team gets one immediate starter from the rookie class, they either hit the jackpot or had a glaring need at a position. It's probably useful to keep this in mind when thinking about the next draft. We should hope that the draft will yield one first-year starter--anything beyond that is gravy. An expectation that the draft will yield multiple rookie starters is unrealistic. I understand what you are saying, but they are the teams future. Which is why i LOVE what they are doing with Reiff. Personally, I wanted the Lions to take Broyles....but not in the second round. I thought they could have gotten him later, perhaps the fourth round. That may have been too late, and he could have been off the board by then. But with CJ, Nate and TY clearly being well ahead of him, I thought it was too early. It's worked in the Lions favor, given the injuries. But that doesn't mean it was a smart move at the time. With our offensive line facing some serious turnover in the next two to three seasons, I think it would have been wiser to take Konz in round two. As for teams averaging less than one starter in the first round of a draft.....I really don't care. The Lions had enough holes and lack of talent, despite their record last season, that they could have gotten talent upgrades who likely would have started either immediately, or soon after the start of the season. Bentley was a day one starter, but that was more by default than a result of his outstanding talent. Personally, I preferred Jayron Hosely anyways. I am not giving up on Schwartz and Mayhew when it comes to the draft. I just think that they need to be a little more cerebral with their selections, rather than seeing a "bargain" level of talent at a particular selection and going with it. There's a reason why other teams have passed on that player. Titus Young is proving himself to be an unreliable receiver on the field, and an A-1 douchebag off the field. Someone in the organization needs to slap the taste out of his mouth, and I hope that someone will be a healthy Louis Delmas. Lions really missed the mark on Young. They could have taken Torrey Smith or Randall Cobb. Maybe they will start paying more attention to character. We still could have taken Keyshaun Martin in the 4th if Broyles was gone. Given the state of our OL, and given the state of our secondary a DB or OLman would have been the better pick. Kontz would have added more to this team right now, as would Trumain Johnson. Johnson would likely be starting for us at #2 CB right now had he been our second round pick, or at one of the safety positions.